The work of Bach scholars is often not unlike that of a detective. In particular his chamber music raises many questions in regard to the time and reason for composition. The three sonatas for harpsichord and viola da gamba are no exception. There is no universal agreement as to when these sonatas were written. It has been suggested they were composed during Bach's time in Cöthen. One of his colleagues was the famous gambist Christian Ferdinand Abel; maybe Bach composed the sonatas for him. Moreover, his employer was an avid lover of the gamba, so music for this instrument would go down well with him. In his early years Bach regularly included gamba parts in his works, for instance in Cantata 106 - the so-called Actus Tragicus - which dates from 1707. At that time it was still a common instrument. It is also possible that Bach composed the sonatas in Leipzig. Could they have been written for Christian Ferdinand Abel's son Carl Friedrich? When his father died in 1737 he moved to Leipzig where he became part of the Bach household and a pupil of Johann Sebastian. He would become one of the most famous gambists of his time. This could explain the choice of the gamba as a solo instrument, since at that time it was increasingly marginalised in favour of the cello. The sonatas are a mixture of 'old' and 'new': the gamba was an instrument of the past; the independent role of the keyboard in these sonatas points to the future. Whereas the sonatas BWV 1027 and 1028 are in four movements, following the model of the Corellian sonata da chiesa, the sonata BWV 1029 takes the form of the Vivaldian concerto, with three movements: fast-slow-fast. Idiomatically it is the most galant of the three. Another interesting question is whether these three sonatas were originally part of a cycle of six, like the sonatas and partitas for violin solo and the suites for cello solo. The sonatas BWV 1028 and 1029 have been preserved in copies by Christian Friedrich Penzel, who entered the Thomasschule in Leipzig in 1751. The title page of the duplicate of BWV 1029 states that Penzel's copy contained these two sonatas and four others. This at least suggests that Bach had originally written six sonatas for this scoring. One aspect is especially important in regard to the performance. Only BWV 1027 has been preserved in Bach's autograph, and the title page says Sonata à Cembalo è Viola da Gamba, which is an indication that the two instruments are treated as equals. That should be respected in the performance, but that is not always the case. Too often the balance is in favour of the viola da gamba, whereas the harpsichord is under-exposed as I noticed in my review of the Naxos recording of Aapo Häkkinen and Mikko Perkola. In the present recording the balance is generally satisfying. The frontispiece uses the title of the autograph of BWV 1027, but unfortunately this didn't make the record company mention the harpsichordist's name first. In my review of the Naxos recording I also noticed the slowness of the performances, lasting more than 52 minutes. I referred to Michael Behringer and Hille Perl (Hänssler Bach Edition) who needed less than 38. With a little under 45 minutes De Pasquale and Boulanger are somewhere in the middle, and I found their tempi mostly just right. Only the andante of BWV 1028 could have been a little faster. 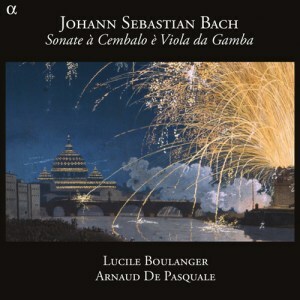 Lucile Boulanger plays with passion and produces a beautiful tone. Her treatment of the notes is such that the rhythmic pulse comes off perfectly. The fast movements go with a swing, whereas the slow movements have a great deal of intensity. In most recordings these three sonatas are complemented by other pieces. The addition of a harpsichord piece is the most logical option. Here we get one of the six toccatas for manuals only. These belong to Bach's most brilliant pieces, and the Toccata in c minor (BWV 911) gives Arnaud De Pasquale plenty of opportunities to show his technical prowess. He delivers a technically immaculate and musically captivating interpretation. He plays a beautiful instrument, a copy of a harpsichord by Jean Henry Silbermann from the second half of the 18th century. Less common is the other addition to the programme: Bach's Sonata in e minor (BWV 1023) for violin and bc, here transposed to D minor and performed as a sonata for viola da gamba and bc. Bach himself frequently adapted his own works for other instruments and therefore there is no objection to modern performers doing the same. Much depends on whether it works musically speaking, and that is the case here. The two artists defend this version in a most persuasive manner. There is no lack of recordings of the sonatas for harpsichord and viola da gamba. I haven't heard that many which really satisfy me, and that often has to do with the balance between the two instruments. That is different here, and as the interpretation is very good I rate these performances among the best I have heard.